BRISTOL – The Tax Office - CMW Tax Services LLC offers professionalism, consistency, and the personal touch in preparing your individual or business taxes. “And then there’s the fact that we’re open all year long. So if you have any issues with your tax return in the off season, if you get a letter from the IRS or anything like that, whenever you call here there’s someone to answer your questions and help,” she said. Woods said she offers a very different service from large tax preparation franchises, which are more of an assembly line experience with tax preparers who may not have adequate training. She previously worked for Tax Offices of America and Hoffnagle Associates, both in Bristol. Then she went to work for her friend Leo Carr, when he ran The Tax Office LLC. “We worked together for probably 10 or 11 years at his business. Then he died in 2015, so I purchased the business at that point,” she said. She has a degree in accounting from Briarwood College and has done further study at Central Connecticut State University. She has two fellow tax preparers in the office: Karen Walsh, who graduated with a degree in accounting from Boston College, and Jesse Cavallaro, who graduated with a degree in accounting from Salve Regina University. “It is convenient to have your financial planner and tax advisor communicating and working together for your benefit. Our goal is provide knowledgeable, professional service in a confidential and comfortable space at an affordable price,” she said. “We have about 1,000 clients and probably 80 percent of them have been with this business, with either me personally or with Leo, for anywhere from 10 to 15 years,” she said. Tax season has begun. “Our schedule fills fast so call now to book an appointment,” Woods added. 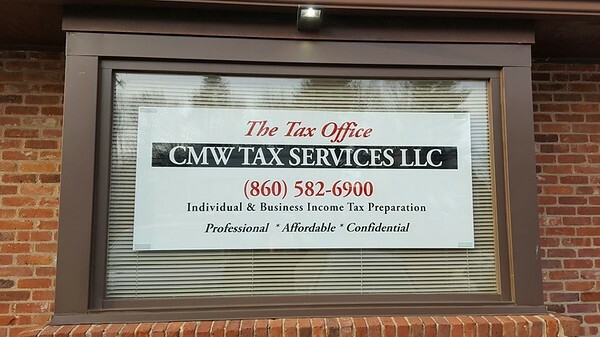 The Tax Office - CMW Tax Services LLC is located at 1001 Farmington Ave., Suite 202, Bristol, CT 06010. For more information, call 860-582-6900 or find them on Facebook. Posted in The Bristol Press, Central CT Chamber of Commerce, General Business, on Tuesday, 15 January 2019 19:27. Updated: Tuesday, 15 January 2019 19:30.